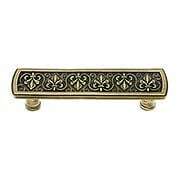 Add an ornate touch to your drawers and cabinets with decorative drawer and cabinet pulls. 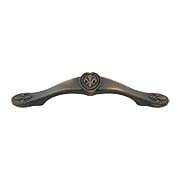 These beautifully designed decorative pulls are available in a wide variety of styles and finishes that will perfectly accent your period home. Widely popular in the 1930's Depression era, our Waterfall Pull with Bakelite Accents (4 1/4-Inch Center-to-Center) is retro design at its best. This faithful reproduction is cast in zinc for precision detail, finished in antique brass, and features Bakelite accents, just like the originals. Whether antique or contemporary, this treasure is an elegant embellishment to furniture and cabinets throughout your home. 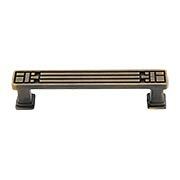 Widely popular in the 1930's Depression era, our Waterfall drawer pull is retro design at its best. This faithful reproduction is cast in zinc for precision detail, finished in antique brass, and features a Bakelite insert, just like the orginals. Whether antique or contemporary, this treasure is an elegant way to embelish furniture and cabinets throughout your home. 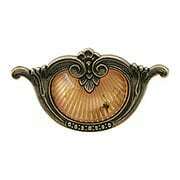 The Orleans Drawer Pull (4-Inch Center-to-Center) gives your windows and cabinets a touch of French flair. Crafted from heavy-duty cast iron, it features a vintage lacquer finish. Wherever you use it, this durable handle withstands the test of time. 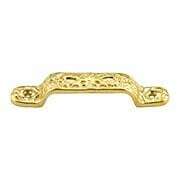 This late Victorian pull is elegant enough for fine furniture and sturdy enough for you kitchen cabinets. 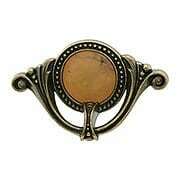 The intricate classical design is cast in solid brass from an antique original. Hand-finished with our living antique patina. 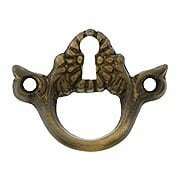 Victorian era reproduction of a keyhole finger pull for cabinets or furniture. Made of solid cast brass and finished with our exclusive living patina. Measures 1 5/8" H x 2 1/8" W x 5/8" P.
Widely popular in the 1930's Depression era, our Waterfall Pull with Bakelite Accents (4 1/2-Inch Center-to-Center) is retro design at its best. This faithful reproduction is cast in zinc for precision detail, finished in antique brass, and features Bakelite accents, just like the originals. Whether antique or contemporary, this treasure is an elegant embellishment to furniture and cabinets throughout your home. Widely popular in the 1930's Depression era, our Waterfall pull is retro design at its best. This faithful reproduction is cast in zinc for precision detail, finished in antique brass, and features a Bakelite insert, just like the orginals. Whether antique or contemporary, this treasure is an elegant embelishment to furniture and cabinets throughout your home. "Key bow" pulls with a fancy pierced escutcheon were popularized in the Federal period on secretary and breakfront cabinets. Made of solid brass, this modern recreation works equally well on kitchen or bath cupboards. Lacquered. A traditional rope border makes this large pull a favorite for Colonial Revival style kitchens. Finely crafted from forged brass, it's as durable as it is attractive. Choose from 6 classic finishes! 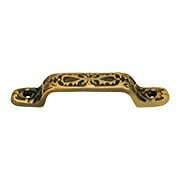 This late Victorian pull is elegant enough for fine furniture and sturdy enough for you kitchen cabinets. The intricate classical design is cast in solid brass from an antique original. Unlacquered. 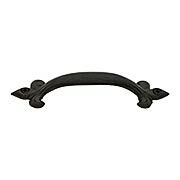 The Odessa 3 3/4" Center-to-Center Cabinet Pull enhances the look of any cabinet. Each is adorned with a flurry of nature-inspired swirls and traditional-style beaded borders. Choose from an array of popular finishes. 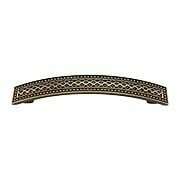 The classic motif of our Large Ribbon and Reed Drawer Pull (4-Inch Center-to-Center) offers elegant, timeless appeal. Forged from solid brass, it is as durable as it is attractive. Choose from a host of popular finish options. The Rochester 3 3/4" Center-to-Center Cabinet Pull is ideal for Mission/Arts &Crafts and even modern-style furniture and cabinets. Featuring a crisp and geometric design, it comes in an array of popular finishes, making it easy to match your decor. 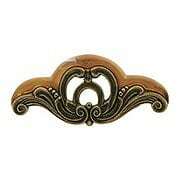 Adorned with a leafy motif, the Tuscan Cabinet Pull (3-Inch Center-to-Center) brings a classic look to any decor. Finely cast, this elegant design comes in a host of popular finish options. What a lovely addition to furniture and cabinetry alike. 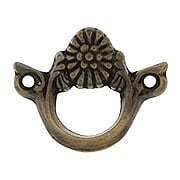 Victorian era reproduction of a finger pull for cabinets or furniture. Made of solid cast brass and finished with our exclusive living patina. 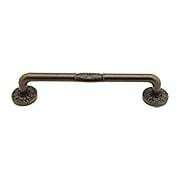 Measures 1 5/8" H x 2 1/8" W x 5/8" P.
This late Victorian pull adds that "certain something" to your kitchen or bath. 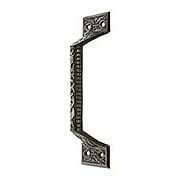 Decorative, but not overly ornate, it compliments a wide variety of cabinet styles. 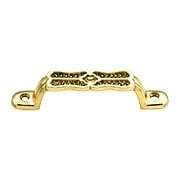 Reproduced in durable cast brass. The classic motif of our Oversized Ribbon and Reed Drawer Pull (6-Inch Center-to-Center) offers elegant, timeless appeal. Forged from solid brass, it is as durable as it is attractive. Choose from a host of popular finish options. 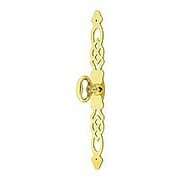 Reminiscent of mid 18th-century style, the Trevi Cabinet Pull is an elegant addition to your décor. Featuring a rococo inspired crisscross pattern, it comes in an array of popular finishes to coordinate with hardware and lighting throughout your home. Use it for kitchen or bath cabinets, or to update vintage furniture. 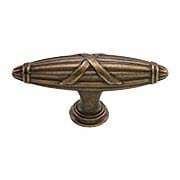 Adorned with a leafy motif, the Tuscan Cabinet Pull (5-Inch Center-to-Center) brings a classic look to any decor. Finely cast, this elegant design comes in a host of popular finish options. What a lovely addition to furniture and cabinetry alike. 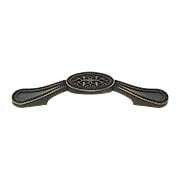 Evoking French-renaissance style, our Bienville 3 3/4" Center-to-Center Cabinet Pull adds instant elegance to furniture and cabinets throughout your home. 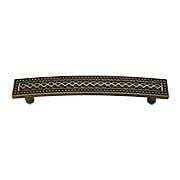 Featuring a traditional fleur-de-lis with beaded border, it comes available in an array of rich finish options. 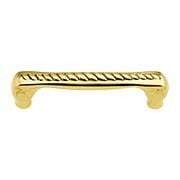 The classic motif of our Small Ribbon and Reed Drawer Pull (3-Inch Center-to-Center) offers elegant, timeless appeal. Forged from solid brass, it is as durable as it is attractive. Choose from a host of popular finish options. The Maltese Collection evokes old-world style. 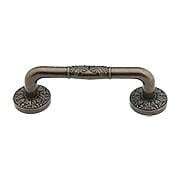 This fashionable pull features stylized scrolls highlighted by a rich finish and an easy grasp design. It is suited for drawers and cabinets in a variety of interiors, from Victorian to Romantic Revival. Delphi Ribbon & Reed T-Pull - 2 3/4"
Elegant neoclassical styling gives the Delphi T-Pull timeless appeal. Featuring a traditional ribbon and reed motif, it comes in an array of popular finishes to coordinate with hardware and lighting throughout your home. 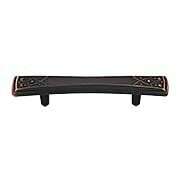 Use it for kitchen or bath cabinets, or to update a vintage hutch or cabinet. The Regency 3 3/4" Floral Cabinet Pull lends a dignified, polished look to your kitchen or bath. This elegant accent features a nature-inspired motif and crisp clean edges. An array of classic finish options make it easy to coordinate with your decor and lighting. The classic motif of our Medium Ribbon and Reed Drawer Pull (3 1/2-Inch Center-to-Center) offers elegant, timeless appeal. 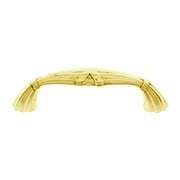 Forged from solid brass, it is as durable as it is attractive. Choose from a host of popular finish options. The classic motif of our Extra-Large Ribbon and Reed Drawer Pull (10-Inch Center-to-Center) offers elegant, timeless appeal. 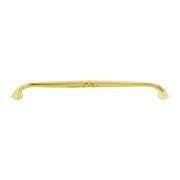 Forged from solid brass, it is as durable as it is attractive. Choose from a host of popular finish options. 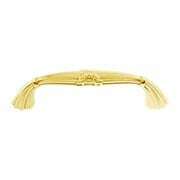 Reminiscent of mid 18th-century style, the Trevi Crest Pull is an elegant addition to your décor. Featuring a rococo inspired crisscross pattern, it comes in an array of popular finishes to coordinate with hardware and lighting throughout your home. Use it for kitchen or bath cabinets, or to update vintage furniture. The Rochester 5" Center-to-Center Cabinet Pull is ideal for Mission/Arts &Crafts and even modern-style furniture and cabinets. Featuring a crisp and geometric design, it comes in an array of popular finishes, making it easy to match your decor.